Epiphytes usually grow where there is plenty of air movement, ample light but also shade and to achieve this they are frequently found well above the ground storey in the forest from where, should they be dislodged from their host and fall to the forest floor they wither and die. With most plants the roots grow downwards, however, with epiphytes in their natural habitat, the roots may grow up, down or around their host, that is, in any direction in search of suitable conditions. As a novice grower I urge you to learn all you can about the natural habitat of the plant and its principal host, bearing in mind that in accounts of plants that grow on rock faces, often they are growing with their roots in crevices into which any moisture drains and maybe in an accumulation of leaf litter. Frequently the rocks on which the lithophytic orchids grow are sandstone – a rock which can absorb moisture and consequently keeps cool longer than most other rocks. “In an exposed situation” should not be construed as being in full sun all of the time: usually they receive some shade. With the possible exception of Cymbidium canaliculatum few epiphytes grow at their best in full sun in nature. Full sun in the hot dry South Australian summer will usually burn off the plants or at the best cause severe yellowing and loss of leaves. It is to be noted that this State has no native epiphytic orchids. Most Australian epiphytic orchids grow in the coastal belt of northern New South Wales and Queensland where the average rainfall in their DRY season is much the same as the Adelaide winter or WET season with which it coincides, consequently advice that plants require to dry out during the winter should not be taken to the extreme and the plants left without water. The three principal requirements of epiphytes are a free air circulation, a semi-shaded position and free drainage. In South Australia epiphytes are grown in two ways, the most popular being pot culture and the other slab culture. For pot culture the medium must be a free draining one and a mixture of “aged” pinebark, scoria and charcoal is quite effective. Note 2015 – Today the potting media used is composted pine bark. Charcoal is not used and scoria can get cold and wet in winter. In choosing material for slab culture consider the conditions under which you intend to grow the plants. For humid conditions cork is ideal while tree fern, which holds moisture longer, is good for dry conditions, although any of our native trees with papery or corky bark is suitable. Perhaps you would wish to attach the plants directly to trees in your garden, for this purpose try Jacaranda, Melaleuca or trees with a similar bark. Watering is important, slab culture requires more watering than pot culture and in summer water orchids on slabs at least every second day and every-day during a hot spell. Water according to the weather and watch for signs of stress – in wintertime the rain is usually sufficient. Fertilising is best done using half of the recommended strength of commercial proprietary fertilisers. As a last general recommendation – beware of frosts. Last year (1982) the frosts in some areas of Adelaide caused severe losses amongst plants of epiphytic native orchids. Large tubs of D*. speciosum, whose thick leathery leaves I mistakenly thought frost resistant, were reduced to a mass of leafless canes; even baskets of D. kingianum hanging three feet below the 50% shadecloth had all of the leaves burnt off. These were but two of the varieties which suffered, so be warned and ensure that your plants are protected from frosts. 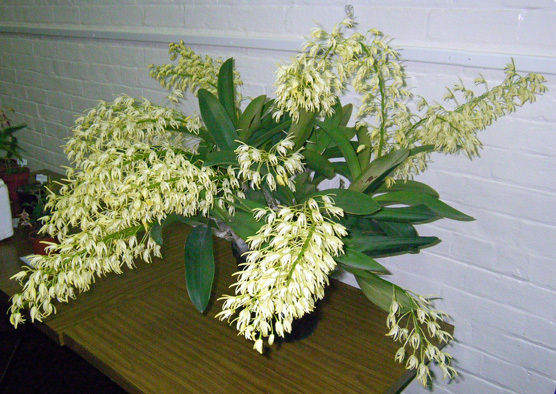 This entry was posted in Growing Epiphytes/Lithophytes and tagged Adelaide, Australian orchids, Cymbidium canaliculatum, Dendrobium, Dendrobium kingianum, Dendrobium speciosum, epiphytes, Growing Ephiphytes, Growing ephiphytes in South Australia, Native Orchids, Orchid growing in Adelaide, orchids, South Australia. Bookmark the permalink.